What's the best solution to display a mind map in PowerPoint? 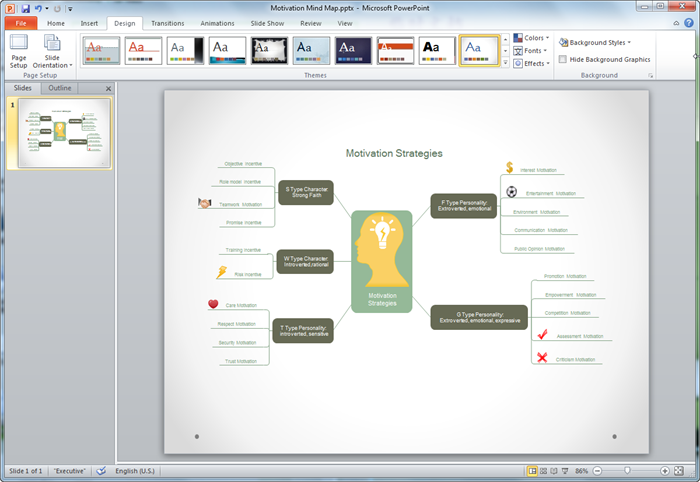 This tutorial teaches you how to create a mind map and export to PPT file with a single click. The program supports Mac, Windows and Linux systems. 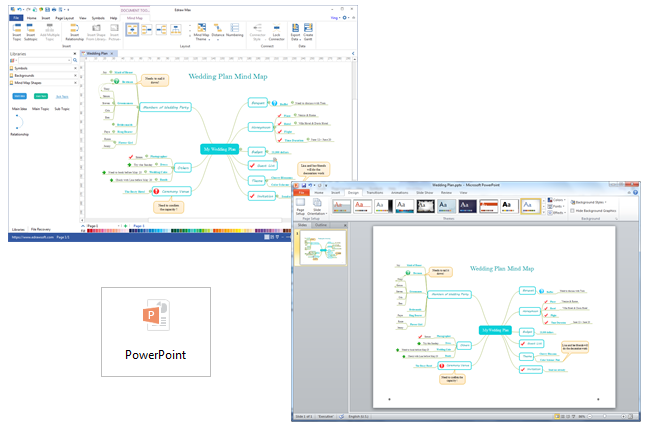 It's not easy to create a mind map directly in PowerPoint - but you can try it another way - create in Edraw and export to PPT format with a single click. You will love this user-friendly mind map maker for Mac as it contains lots of automatic features. It requires only a few minutes to complete a mind map and export to PPT format. It works on Mac, PC and Linux. A mind map is a diagram used to organize ideas and clarify thinking. It has a main topic in the center and with other ideas and concepts radiating from the main topic. Mind maps are used to visualize, organize, and classify ideas, making them perfect for organizing information, problem solving, writing and making decisions. Creating a mind map with pre-drawn mind map symbols and templates is fast and easy. 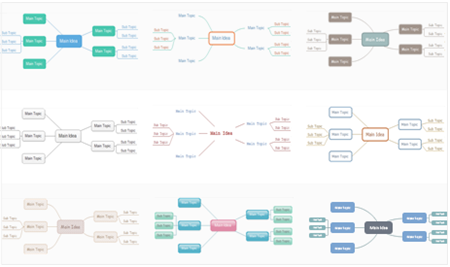 Nothing new to draw, through simply drag-and-drop and point-and-click, you can produce professional looking mind maps. To draw it fast, there are some tricks you can learn. A dynamic main idea symbol is already in the middle of the canvas. Click the floating button on the main idea symbol to add sub topics. Continue to add more sub topics until you finish. Add symbols from the pre-defined libraries on the left of the canvas. Choose a best layout style from the arrangement direction gallery. Apply a mind map theme from the theme gallery. Insert hyperlinks, attachments or notes from the Insert menu. Click Export Data button to export the content to other files. The finished mind map can be exported to PPT format instantly with one button click. Edraw is compatible with MS PowerPoint, which means the EDDX files can be converted into PowerPoint files seamlessly. In this way, you can present visually pleasing mind maps in PPT with no obstacles. Simply go to File tab, click Export and Send button and choose PowerPoint to save your file as PPTX format. The exported mind map will remain the vector feature in the MS PowerPoint. You can still edit text, recolor shape, and apply quick style in MS PowerPoint. Discover why Edraw is an excellent program to create mind map. Try Mind Map Software FREE.